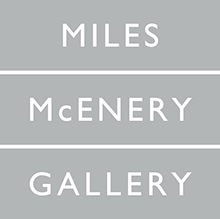 NEW YORK, NEW YORK – AMERINGER | McENERY | YOHE is pleased to announce an exhibition of paintings by Kiyoshi Nakagami. The exhibition will open 14 December 2017 at 524 West 19th Street and will remain on view through 27 January 2018. Kiyoshi Nakagami creates fantastical works that burst with a tension between light and dark. His billowing cloud-like forms seem faintly familiar, reminiscent of moonlight streaming through the clouds on a dark and stormy evening. However, each canvas is also imbued with a lucid quality, as if one is peering into a dreamscape. Nakagami’s paintings embody nihonga, a style of Japanese art that abandons the western concept of replication and focuses instead on manifesting the essence of an environment. Following the principles of nihonga, Nakagami believes that capturing the natural world through artistic representation is unattainable, and chooses instead to focus on light and its effect on different structures. The light sources are never exposed, forming an ambiguous space that remains suspended between reality and fantasy. Nakagami begins his alluring works by coating a canvas in acrylic paint and dusting mica-enriched gold pigment across the surface. He then moves and manipulates the panel, allowing gravity to take its course. His reliance on natural forces obscures the artist’s gesture, bringing the focus to the resulting work rather than the artist’s ego. These canvases—filled with illusionary, cosmic forms—draw the viewer into their unique, quiet world and inspire contemplative meditation. KIYOSHI NAKAGAMI was born in 1949 in Shizuoka, Japan. He has had numerous solo exhibitions including Hino Gallery, Tokyo, Japan; Galerie Richard, Paris, France and New York, NY; Gallery Finarte, Nagoya, Japan; Art-Taguchi, Gifu, Japan; Museum Haus Kasuya, Yokosuka, Japan; and The Museum of Modern Art, Kamakura, Japan. Recent group exhibitions include “The Advent of RINPA – Touring the ‘RINPA CODE’ of the Pre-Modern / Modern / Contemporary,” Kyoto Municipal Museum of Art, Kyoto, Japan; “Dawn of Gods: Encounter of Venus, and Spiritual Landscape, East and West,” Oita Prefectural Museum, Oita, Japan; “Modern: Blossoming Garden- Oita World Museum,” Oita Prefectural Art Museum, Oita, Japan; “Various Representations Related to Light,” Yokohama Museum of Art, Yokahama, Japan; and “Prolonging Pleasure: Stefan Hoenerloh/Kiyoshi Nakagami,” Galerie Richard, Paris, France. His work may be found in the permanent collections of Aichi Prefectural Museum of Art, Aichi; Kanagawa Prefectural Gallery, Kanagawa; The Museum of Modern Art, Kamakura and Hayama, Kanagawa; The National Museum of Modern Art, Tokyo; and Yokohama Museum of Art, Yokohama. In 2009, he received the Yokohama City Cultural Prize in Art. Kiyoshi Nakagami lives and works in Kanagawa, Japan.